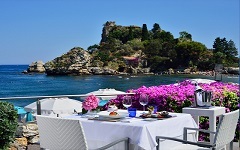 A member of the Ragosta Hotels Collection, La Plage Resort is located inside the Isola Bella Nature Reserve in Taormina, surrounded by maritime pines and fragrant gardens. Directly on the beach, just a few steps from the cable car going to the historic town centre of Taormina, from any spot inside La Plage Resort and its beach, you can enjoy breathtaking views of the bay of Isola Bella. La Plage Resort is an eco-friendly hotel that makes respect for the Isola Bella Nature Reserve one of its strongholds and strengths, making it popular with guests from all over the world. The rooms, bungalows and suites of the La Plage Resort are designed and furnished with modern, informal design and take into account the surrounding nature, aiming to have a minimal impact on it. The external private Jacuzzi, with a view of the sea or of the ancient pine forest, make your stay a precious one, also enriched by the beach services and by a convenient indoor car park. The Fusion Restaurant will delight guests with its traditional Sicilian and Mediterranean dishes, enhancing the flavours and colours of the location; the Fusion Bar completes the culinary offering with a wide choice of cocktails and spirits. The services of the Expure Spa will make your stay at the La Plage Resort more relaxing, with the Turkish bath, Jacuzzis and massage cabins.